Have you been just laaaaaanguishing wondering about how you could become more "cultured"? I know. I totally knew you were, and I am here to help. You've probably just been sitting around your house, sighing, wishing someone (FOR THE LOVE OF ALL THAT IS GOOD) would just tell you the lifelong and nagging question: What is Ms. Daisy's jam? Okay, so was I right, OR WHAT?! Isn't that the best song, like everrr? Now, I can not recommend the spelling and lexicon of the person who wrote up the lyrics on there, but who cares, the song is still just that awesome. Now, you've got the music side of your brain taken care of, but you're missing art! I love art. I love going to the Detroit Institute of Arts and walking around the galleries. If I didn't have littles with me and the need to run out every two hours to feed the parking meter all of the quarters I've ever owned in my life, I could stay in there all day. I am drawn to European art, especially Impressionism (but I do have a special place in my heart for art of the Renaissance and Baroque eras - oh, and cubism.). Mary Cassatt, Picasso, Monet, Manet, van Gogh, Renoir - I could spend half of a day just in that section. Outside of European art, my favorite thing in the whole DIA is Diego Rivera's gallery room of murals - top to bottom, telling crazy stories about this world with so overwhelmingly much stuff to look at, your brain and heart go crazy at the same time. And if you are there when the sun is shining, it's like a trifecta of joy. There is one, however, who stands out to me strongly and has some strange emotional pull behind his work. When I was walking up and down the galleries one day, I happened upon his work and it was like something inside the painting pulled me over to it. It was okay to stare, which is good, because I couldn't stop doing so. I was like a gawker in a five car wreck on the expressway. I thought, "I should go look around at what else is here now since I am staring like a dazed weirdo..." and then I didn't. I kept staring. She was staring back at me, though, and I'm sure she was trying to tell me something (I don't know what it was), so I just kept staring. I tore myself away (finally) and looked around the room, but before I left it, I had to go back over again and stare some more. Who on earth is that artist, anyway? I had to know. 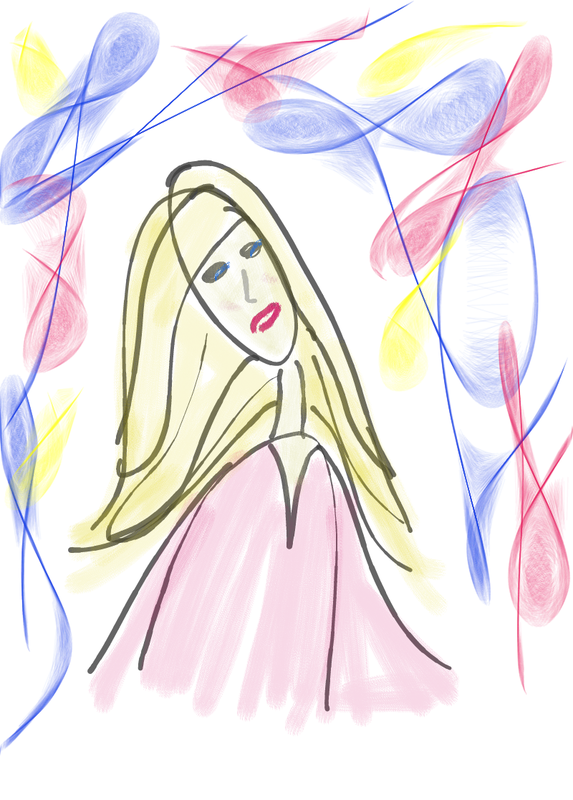 I am not an artist, but I pretend to be one on tv, so I painted my own painting in the style of Modigliani just for all a-ya'll. I know, try not to ask for my autograph all at the same time. Okay, okay, you can. Go ahead. I mean, maybe you've already seen my awesome drawings in previous posts? I just got this new paint app on my tablet and I've been playing with it. So, here is my awesome (toddleresque) rendition of my own sort of Modigliani for your viewing pleasure to round out your culture lesson for the day. Wow. See. Did I tell you or what? Amazing? Huh? Huh? Yeah, I know, thanks. Try not to cheer aloud at your desk while you're supposed to be working, people will get suspicious. p.s. 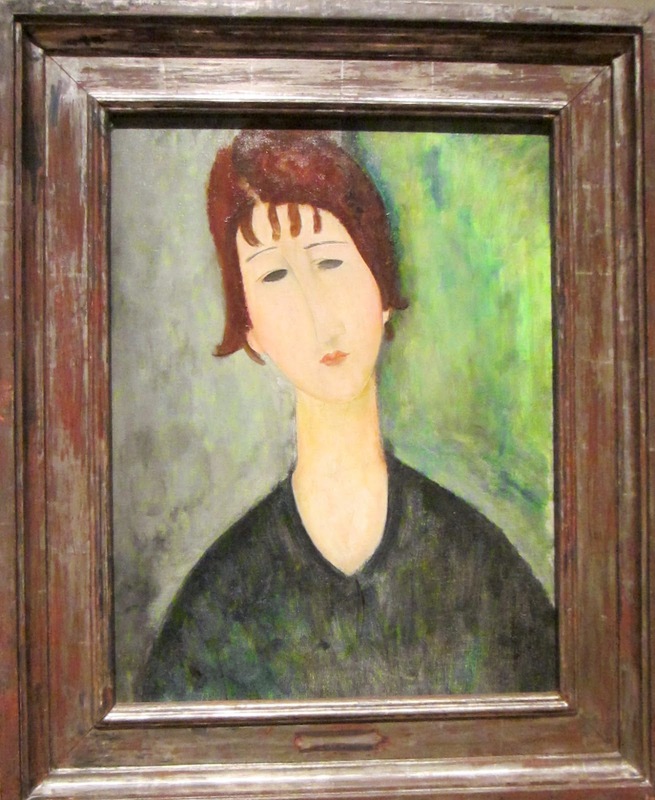 If you want to read up on Modigliani (here: part 1 and part 2) I wrote a post on a biography of him over on my reading club page.